This page will introduce the way to extend a disk partition (system partition and data partition) on Windows 64 bit Operating System. Download IM-Magic Partition Resizer Server for Windows 64 bit partition resizing. It supports all Windows operating system and it is 100% safe. Have you ever wanted to extend a disk partition on Windows 64 bit but finally you find no way? It is not an easy work to extend a disk partition especially a system partition unless you can get a good partition manger. 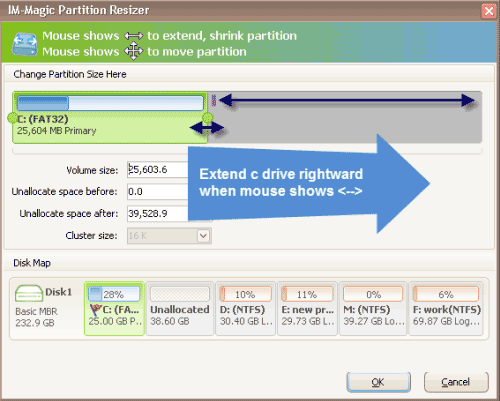 IM-Magic Partition Resizer has many advanced features to help you extend any disk partition easily and effectively. The software supports to extend an NTFS partition and FAT partition without rebooting your computer reinstalling system. Download, install and launch IM-Magic Partition Resizer on your computer. Right click a partition that has much free disk space and go to "Resize/Move" option. 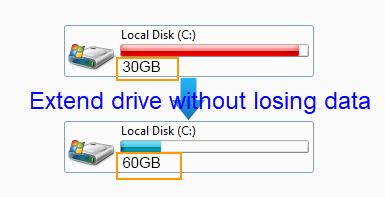 Shrink the selected partition by moving the arrow rightward or leftward, and then you can see an unallocated space. Move the unallocated space close to the partition you want to extend and right click this partition and then choose "Resize/Move" option. Extend the selected partition and click "Apply" button. Windows operating system includes Windows 32 bit system and Windows 64 bit system. The Windows 64 bit system is more effectively than a Windows 32 system, so many users would like to install Windows 64 bit system on their computer. In the process of using a Windows 64 bit system, many people need to manage disk partition on their computer. Users may do some simple disk management by using Windows built-in tool such as delete a partition or format a partition. However, if they want to resize a disk partition, Windows built-in tool might be helpless. Thus, you may need the help of a third-party partition manager. IM-Magic Partition Resizer is highly recommended for disk partition resizing on a Windows 64 bit system. Many people are quite familiar with Windows 7 operating system and they may know one way to extend disk partition on Windows 7 is to rely on Disk Management. If you want to extend a data partition and there is unallocated space right close to this partition, you may open Disk Management to extend the partition. However, if you want to extend a system partition or there is no existed free space on the disk, you can try another method – extend the partition with help of partition manager. IM-Magic Partition Resizer Free is free partition manager that can working on Windows 7 OS. It supports to extend both system partition and data partition. If you are a Windows XP user, you may know that no Windows built-in tool is available for disk partition resizing on a Windows XP 64 bit operating system. Therefore, you can only rely on partition manager if you want to extend a disk partition. IM-Magic Partition Resizer Free can also work on Windows XP operating system to extend or shrink a disk partition. This partition manager has high security and good performance, with which you can safely resize both NTFS and FAT partition effectively. On Windows Server OS, Windows built-in Disk Management or Diskpart command might be helpful in resizing a disk partition. However, if you are unable or if you feel it difficult to resize a disk partition with the Windows built-in tool, IM-Magic Partition Resizer Server is available for Windows Server users. IM-Magic Partition Resizer Server is compatible with almost all Windows Server operating system such as Windows 2000, Windows 2003, Windows 2003 R2, SBS 2003, Windows 2008 and Windows 2008 R2 and so on. From the information above, you can know IM-Magic Partition Resizer has two editions. You may select the right one for your Windows OS. However, no matter you choose IM-Magic Partition Resizer Free or IM-Magic Partition Resizer Server, it can work perfectly to resize the disk partition without reformatting, rebooting or reinstalling. Therefore, you don’t need to worry that it is waste of time to reboot a computer. You don’t need to worry that important data will get lost due to reformatting. You don’t need to worry that you have no experience in reinstalling a system.